When I got up this AM, my neighbor waved goodbye as he was to meet a relative for breakfast. After he was gone I looked on my table and he had left a whole bag of those sweet plums, I’ll have my fruit for the day now. I packed up in a hurry this AM as the clouds were starting to build and it’s a lot easier to fold all this gear up when it’s dry. About 25 miles from Fort Smith it did start to rain, not the torrential downpours we get at home but a steady rain that required me to stop and don my foul weather gear. 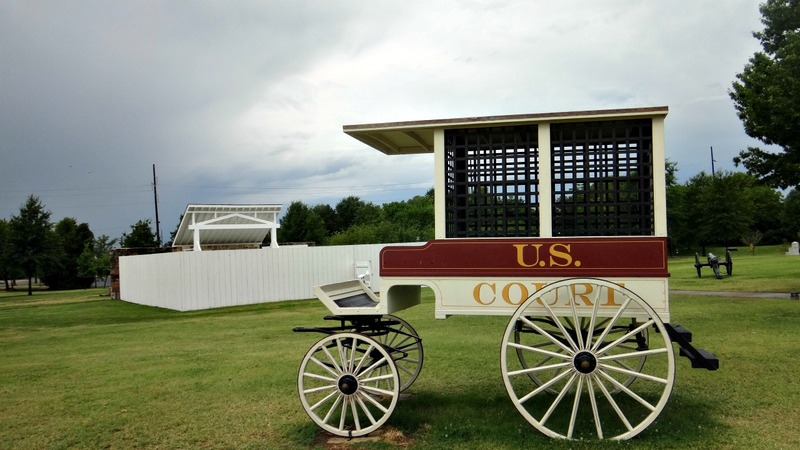 This courthouse in Fort Smith was built in 1846 to serve as “the law” in the wild west and was presided over by Judge Isaac Parker. It was said that he was a fair judge who was dedicated to his job. 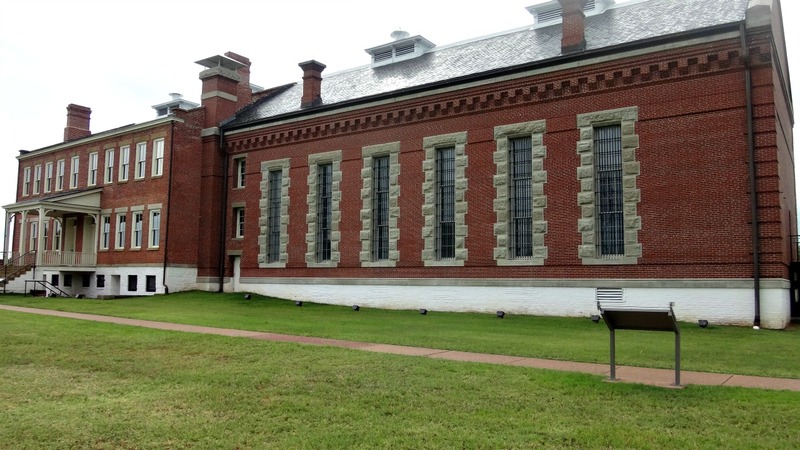 During his 21 year tenure he tried over 13,000 cases and sent 79 folks to the gallows. Guess this was the last ride for some of them. Not much happening the rest of the day, breezed on through Oklahoma City and stopped for fuel in Hinton, where Stuart and I went on to Red Rock Canyon on our last trip. That was a very pretty park but I had to get further down the road. Made it up to Washita Battleground for the stamp and didn’t even get a picture as I was in too much of a hurry to get on to Pampa and down for the night. Rain continued off and on for most of the day until it did stop and then turned very hot, I wished for the rain to come back then. Found the park in Pampa and settled in for the night. Lots of locals here. The folks next to my site were spending the weekend here to celebrate his daughters’ fourth birthday. It’s good there are places like this that are available.